Everything from the North is just…. cooler. Low grey clouds cover all of the visible sky and a stiff westerly breeze chops the surface of the Marine Lake. It is hard to follow the small group of Red-breasted Mergansers feeding in the rolling waves. The water is as grey as the sky. A larger, darker bird resurfaces from a dive. By the time I get the binoculars up and across to its position it has dived again. At least I now know, roughly, the area where it is hunting. A few yards from where it slid under the waves it pops up with barely a splash. A better look this time, yes, that’s it. Just the name lights a spark in me. “Great Northern”. A visitor from the north, from mysterious lands of snow and ice. This is a cool, cool bird from a cool, cool place. 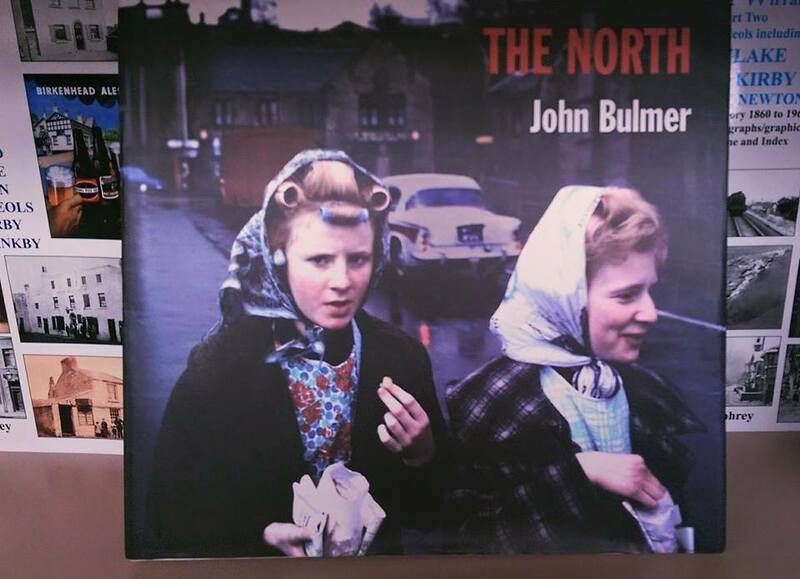 However, not everyone is so enamoured with all things northern. A school friend moved to the south in the early 1990’s and began a relationship with a girl there. When he said he was heading home to the north west for a weekend he asked if she wanted to come. “Will it be safe?” she worriedly asked without a hint of irony or sarcasm. It made me wonder how some in the south actually regard us northerners. She honestly seemed to think we were all feral, lawless scavengers existing on benefits, housed in dimly lit ramshackle workhouses feeding at a trough of potatoes boiled in lard garnished with dead cats then sprinkled with coal dust and forgotten ambition. For dessert, we’d steal each others shoes and eat them before finishing off a good night with some fisticuffs and petty crime. During her trip to the hinterlands in the north, where she wasn’t mugged, didn’t see any burned out cars and didn’t get scurvy, she exclaimed in surprised and mildly patronising tones that it “was actually quite nice!”. Their relationship didn’t last too much longer. He moved back home and she returned south to live on soufflé decorated with the crystallised tears of the poor, shoot badgers and count her money - because that’s what southern softies do isn’t it? Of course they don’t. I have no such prejudices or issues with the south and those from it. I just prefer the north. Music, food, football, fashion, landscape… In my humble opinion all these things increase in coolness the further up the M6 you travel. Attitude improves with latitude. The same, I believe, can be said for wildlife. I love northern wildlife and I mean here in the UK and further afield. The experience I’ve had of the arctic confirmed this for me. Huge landscapes filled with Steller’s and King Eiders, Red Knot, White-tailed Eagles, Orcas, Long-tailed Ducks, Skuas White-billed and Great Northern Divers. These places and species inspire me like no others do. The Great Northern fishing before me is spending the winter on the Patch. 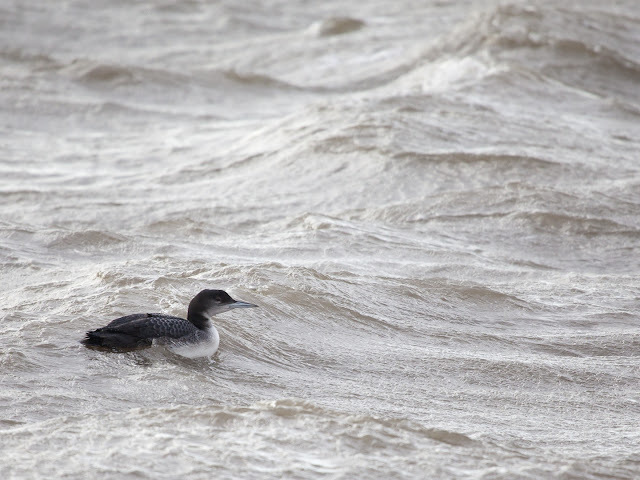 One of these birds would be a good find, usually distant on the Irish Sea off Hilbre; so having one for so long on the marine lake barely a three minute walk from my house is a welcome winter bonus. All the turbulent warm, wet rubbish we’ve had to endure this winter it has made it the worst for Black-tailed Godwits and Knot on the Patch for two decades, so its been good to have something else to point the camera at. 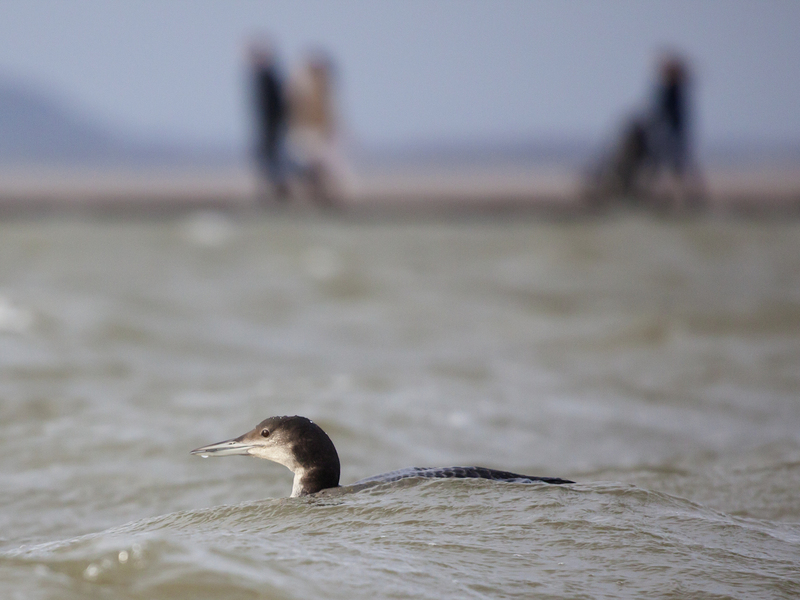 Since mid December the diver has been patrolling the waters of the lake, occasionally drifting on to the sea at high tide but always returning to the confines of the lake as the tide ebbs. It has been well watched and photographed - it seems to be unperturbed by all the attention it has received. 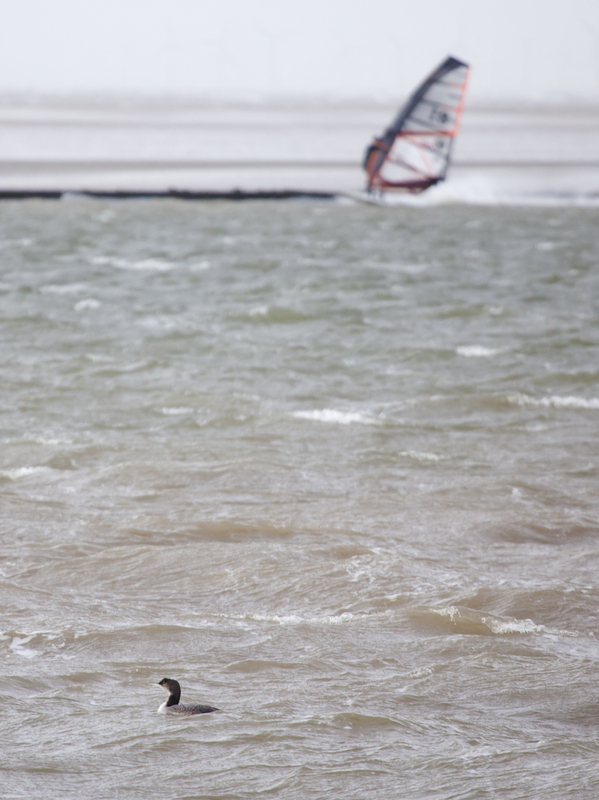 It has even got used to the sailing boats and windsurfers that frequent the lake. Right now it is drifting around, confident, commanding, unruffled… cool. Watching it I can’t help but be impressed. It is sleek but strong - a genuine northern powerhouse. It’s bill really does deserve the description “dagger-like”. The forehead too is impressive, square and imposing, a Great Northern Diver looks like it wouldn’t take any nonsense from anyone. The sun comes out but it doesn’t feel any warmer. 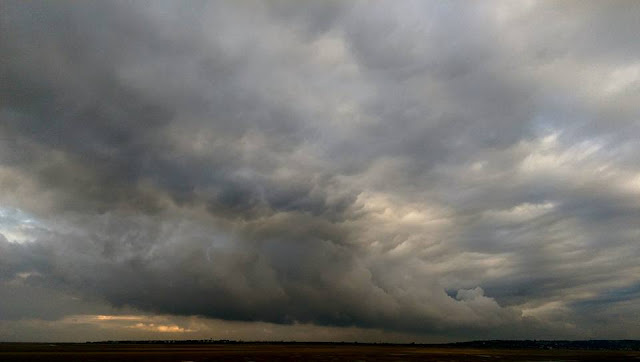 The wind swings slightly towards the north. A Peregrine swoops low over the water chasing a small flock of Dunlin it has spooked from their high tide roost on the narrow limestone wall that separates the lake from estuary. This puts up all the gulls that are loafing on the boat launching pontoons. Even the Mergansers are momentarily scared to energetic flight. The Great Northern briefly looks up, casts its sharp, bright burgundy eye in the falcon’s direction then resumes fishing. Unflappable, calm. Cool. [The only thing that has managed to unsettle the diver was, sadly, caused by lazy human behaviour. One morning it had to be plucked from the waters of the lake with part of a crabbing net wrapped around its bill. In the murky waters of the lake the faded fluorescent pink net must have looked a little like breakfast. 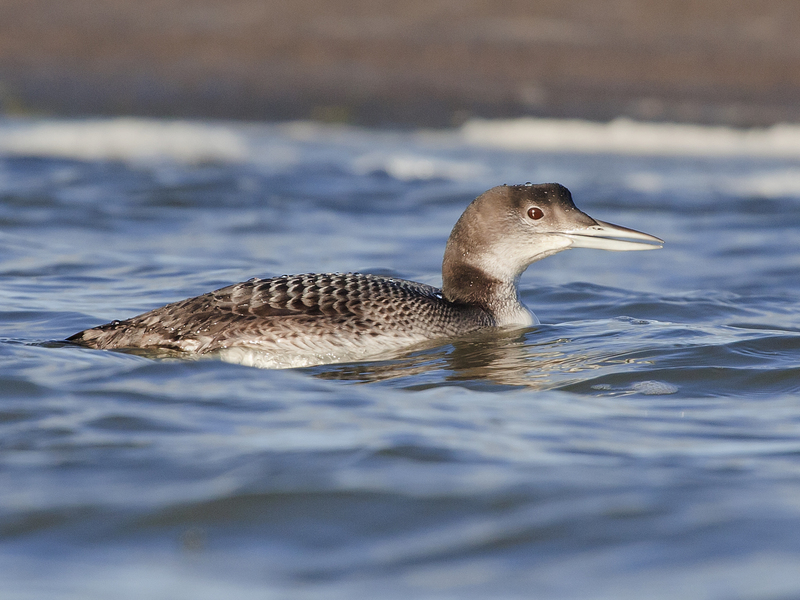 Storms have come and gone, so have the year listers after ticking an “easy” GND. 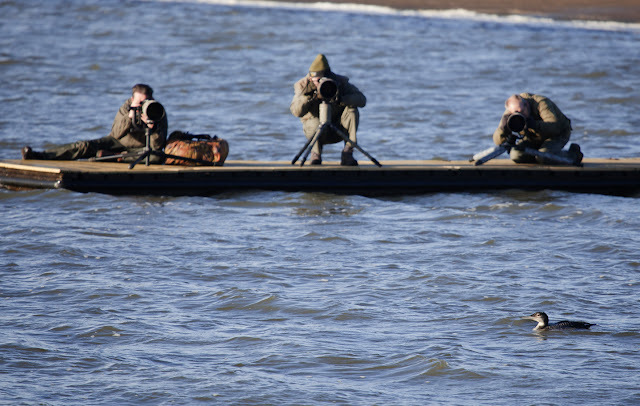 The ‘togs are all off looking to photograph a rare warbler hanging around a local sewage farm. The diver has remained, unmoved, seemingly at home on the lake attached to the little village of West Kirby. I watch it steadily patrol the lake, sometimes seeming like it is watching the people who are walking around the footpath that forms part of the perimeter of the lake. I wonder what it makes of us? It drifts in, close to the wall, totally at ease, looking cool in understated scalloped charcoal grey winter plumage - no need to show off. Less is more. I love this bird. I have a lot of pictures to prove it. 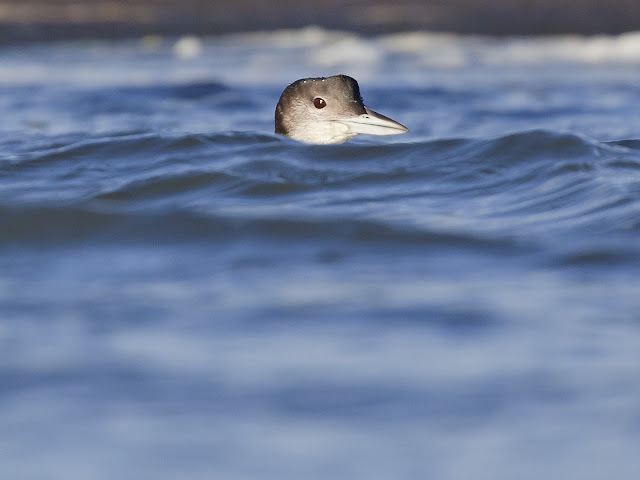 It turns, swims and dives away from me, heading to the northern end of the lake, getting smaller and smaller in the viewfinder. I pack up my camera and walk home. Details about the situations snaps are very impressive. Thanks for sharing this post.